Saturday, January 19, 2019 marked the tenth annual celebration of all-day local high school basketball games between Shorewood and Shorecrest, known by the catchy name, Hoopapalooza. Games were played at Shorecrest and included every basketball team from each school. The freshmen and JV teams squared off during the afternoon, then the girls’ varsity game was played at 5:00pm. Scots took the Thunderbirds 45 to 26, mostly on the strength of the Scots’ persistent defense. The score suggests a closer match than was the case. With the win, the #6 ranked Scots saw their record climb to 8-1 in WesCo, 14-1 for the season. The T-Birds fell to 2-7/4-11. Shorewood brought a full complement of fans, teams and cheerleaders to the event. The Scots contributed a comparable contingent, along with the Vince Caruso-directed band, and the Linda Cobb-led flag team. The gymnasium was full; there was a food truck at the entrance, and the campus lawn serviced as auxiliary parking. The mood was festive, the crowd well behaved, as has become the Hoopapalooza custom. The Scots bolted to a 21-4 lead at the end of the first quarter. The T-Birds narrowed the gap to nine in the third quarter, but couldn’t pull any closer than that. The Thunderbirds simply could not match the speed and skill of the Scots and the point spread continued to build throughout the final quarter. With a 19 point lead and 5.9 seconds to go in the game, the Scots got a little lax and the T-birds stole the ball and drove down the court for what appeared would be a layup just before the final buzzer. Out of nowhere came junior Sydney VanNess for the Scots, as competitive as any player to ever wear the Green and Gold. She sprinted the length of the court, went high in the air and slammed the ball back on top of the opponent. The resounding thud could be heard all over the gym. Hard to tell a kid to stop competing. Scots fans roared for the exclamation point on a big win over their arch-rival. Hard to tell a kid to stop competing. Scots’ second year coach Carlos Humphrey substituted liberally, getting all the girls on his roster meaningful playing time before the playoffs start in February. Senior Audrey Dietz led the way for the Scots with 12 points, while junior Amanda Lee chipped in with 9.
as a player and a Flagger. Dietz, not content to just play the game, surprised many when she joined her Flag team at halftime to perform their well-choreographed routine while still wearing her basketball uniform. There’s no truth to the rumor that the tall post player helped sweep out the gym at the end of the night. Afterwards, Dietz reflected on her last Hoopapalooza. “Although to many it’s just a simple game of basketball, it means so much more than that when you’re out there. "It’s my last rivalry game, it meant I was heading toward the end of my rigorous journey as a high school basketball player, a hard goodbye to be saying. The Scots are in a virtual tie for first place along with Snohomish, Arlington, and Archbishop Murphy, all with only one league loss. 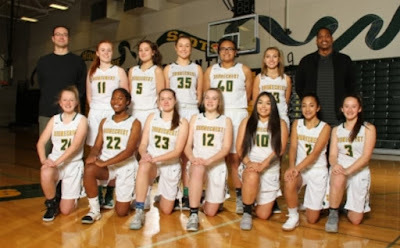 Key games ahead see the Scots travel Tuesday the 22nd to play Murphy, and their home game on Tuesday the 29th against the always dangerous and superbly coached Edmonds-Woodway Warriors will go a long way to determining seeding slots for Districts. SC schedule can be found HERE. For the T-Birds, Mark Haner is a superb coach and his squad showed a lot of improvement since the teams first met on December 5th, a 61-16 SC win. Back then the ball handling was crude, and they seemed a bit unsure of what to do or how to do it. Saturday they showed dribbling and passing skills, an understanding of their offensive plays and defensive styles, and most importantly, a desire to win. Love to see great adult leadership for our children. SW schedule can be found HERE..